Digit online is a mindgame generating millions of calculations which you have to solve. In this section you can find out how to play this game. The idea is quite simple. When the game start you get 4 random numbers and 4 more buttons with the operators + , - , / and x. The game also tells you a target and a timer. So far there is nothing to understand the game just give you this info on the screen. Here is a detailed list with the most important features for this free mindgame game. Also great to learn calculations to your kids in a game atmosphere. 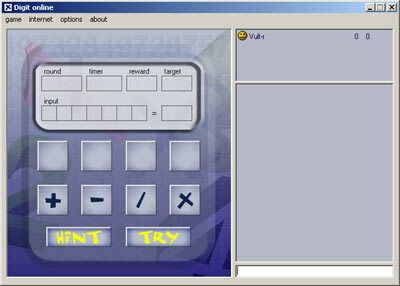 - Fast game engine, generating milions of combinations. This is a screenshot of this free mind game. The screenshot is resized to fit on the website. The size of the actual game is bigger.